On the top of a parent’s list of worst nightmares is receiving a phone call that their child has just been in a car crash. Teens, wide-eyed and excited about getting their first driver’s license, are more prone to motor vehicle crashes, primarily due to their naivety and inexperience. Car accidents are, unfortunately, are a leading cause of teen deaths in the U.S. At Pacific Driver Education LLC in Gresham, Ore., we put your child’s safety first, ensuring they receive the proper education about being behind the wheel. Contact us today to sign your teen up for our driving lessons. 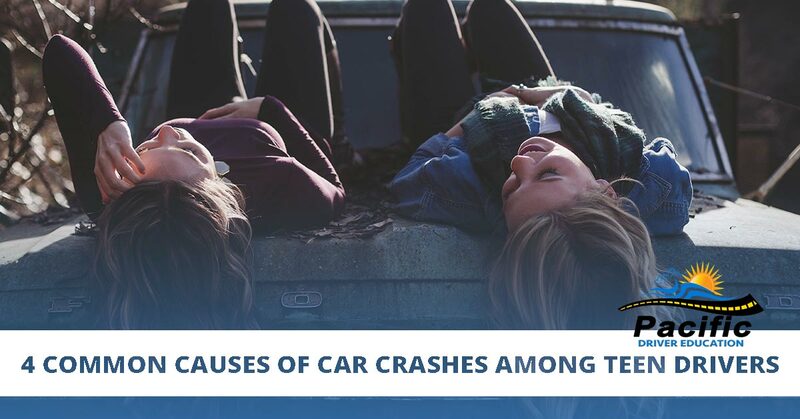 Here are four common causes of U.S. car crashes that involve teen drivers, according to the National Highway Traffic Safety Administration. Teens are statistically more likely to drive faster than older drivers. You might blame it on their “I’m going to live forever” attitudes, but it’s something to talk to your child about, as 29 percent of fatal crashes in 2015 involving teens were due to speeding. This only worsens when there is extreme weather, such as rain or snow. To prevent your teen from speeding, talk to them about the three-second rule — a rule that recommends three seconds between their car and the car in front of them. This rule ensures there is enough stopping distance needed to avoid any collisions. Underage drinking and driving not only puts your child at risk, but puts other parents’ children in danger as well. In 2016, one out of every five teen drivers involved in fatal crashes were caused by alcohol. Talk to your teen about underage drinking, and remind them that the legal age in every state is 21. Also, if they do decide to drink, tell them to call you instead of risking getting behind the wheel. Being grounded is a lot better than being in a severe car crash. This includes everything from texting to eating behind the wheel. As a teenager in today’s technological world, it can be tempting to take a peek at their phone — nearly 40 percent of teens admitted they’ve done it at least once. Tell your teen that any text can wait until they get where they’re going. There’s even a fancy new feature on most phones that automatically sets phones to “Do Not Disturb” mode when a car is in motion. Tell your teen to use it. Try having your teen avoid night-time trips in their first year of driving, if possible. Also, encourage better bedtime habits if you know your teen isn’t getting enough sleep. Our professionals at Pacific Driver Education know your child means the world to you. We offer an ODOT-Approved Driver Education Program for Teens where they receive classroom and behind-the-wheel instruction and driving lessons. If you’re interested in signing your child up for classes, give us a call today at (503) 766-3567 or fill out our online form.